As you can see, it becomes incredibly confusing to decide. So, what is the sweet spot when it comes to word count? Before you wash your hands of the entire content creating process, let’s figure it out together. Surprise! There Isn’t a Right Word Count After All! If the granddaddy of all search engines believes that quality doesn’t hinge on word count, why are we so worried about it? After all, fluff adds no value. On the flip side, no content at all doesn’t do it either. The best way to find what works is through understanding your audience and what communicates best to them. Whether it’s website copy about who you are or a blog post about a certain topic, the ultimate goal of your content should be to communicate to your audience clearly. 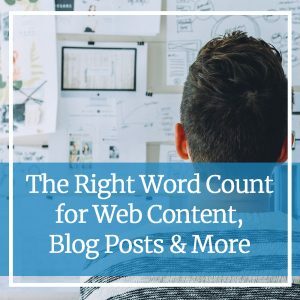 Ensure that your content meets this goal and the “right word count” will follow suit. No matter what the content is, make sure there you have a clear message before you start. For example, if you’re writing an About page for your website, the message should be about how you are different from your competition, and how that benefits your audience. Keep your content on point with the message you’re trying to communicate from start to finish. Staying on point will ensure short ideas stay short and sweet and complex ideas have enough room to develop. Always write until the message is clear. For example, a how-to blog post will have certain steps involved to teach your audience a task. Once your first draft is complete, edit it ruthlessly. Cut the fluff down and kick information out that isn’t important. Don’t be afraid to shift things around, rewrite sections that need clarity or add additional information as it fits. Then, be prepared to edit all over again. Consider your audience’s persona when writing your content. Everyone reads, learns and understands differently, and their demographics and behaviors will have an effect on your content. Is your target audience full of busy business owners? Keep that busyness in mind when you write your blog posts. They might have time for a short-and-to-the-point post, but long-form content might be a crunch. Overall, clear communication is key. Past SEO best practices such as word count have now taken a back seat to quality. Focus on communicating your message to your audience in the best way, always putting your audience first. Need Some Help Writing the Right Content? We get it. Words are hard. Writing content for a specific audience is hard. At CCS, we use your voice to create content that communicates your message clearly. If you need some help, give us a call at 612-643-1824 or send us a quick message. We can’t wait to hear from you!